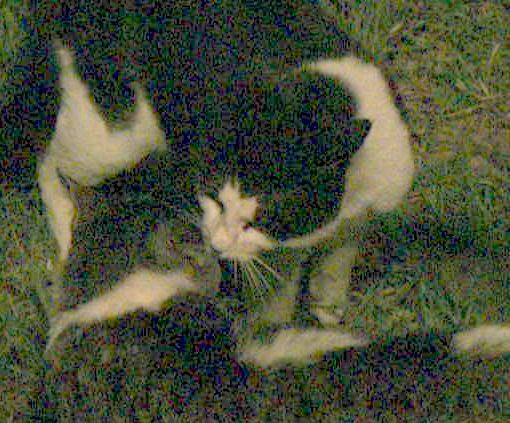 In this case, there's already been an altercation (not shown), and due to some writhing and twisting, the Tabby has a claw stuck intractibly hooked in the hide of the black and white (BW)cat's right forearm, meaning that the angle is such that he can't retract the claw and let thr B&W cat go. The B&W wants to pull away and withdraw, but he's stuck, pulling at the Tabby's claw, and this seems to enrage the Tabby further. The fight is on. With a yowl, the Tabby pulls the BW's forearm in and strikes at the BW's neck with his jaws, raking the BW's right shoulder. The BW comes back with a left handed slash ripping the Tabby's claw out of his own hide and rearing up. Tabby follows through with his now free left arm rears up, and rakes the BW's right shoulder blade. The BW lunges to the left and goes for the side of the Tabby's face. The Tabby jumps to the right and is caught off balance by the BW who now throws him down. The Tabby tucks his head under the BW's stomach, his left front claws still embedded in the BW's shoulder. Both beasts are rolling on the ground. The BW twists and rakes at the Tabby's throat. At the same time, the Tabby throws his upper body back and avois the slash. 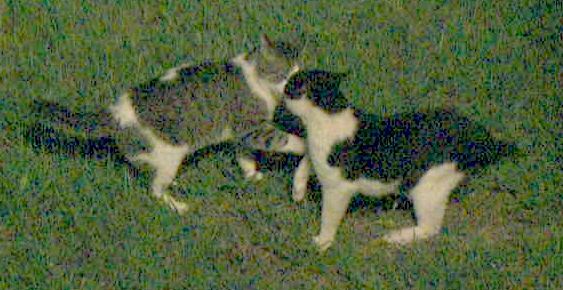 The BW gains his footing and fends off a blow from the Tabby's right front claws. The tabby rakes at the BW's right hind leg with his left hind claws and misses. Following through with his previous move, the BW tries to get on top. Falling back to the left, the Tabby gets out from under the front claws and snapping jaw of the BW. The Tabby lands on his side, presenting the claws of his right foot to the BW's face, stopping the other's lunge. In an instant, the Tabby is back on all fours. There's only 3 inches of highly charged space between the two cats. The Tabby stands tall, confronting the BW again. Note: what has just been described happened in less than 2 seconds. Angrily, the toms slowly close the distance, whiskers forward, ears back, snouts pulsing as their nostrils flare with each breath until there is only 1/2 inch between them. If looks could kill they'd both be bones. A short discussion takes place, and the Tabby turns around and heads to his hard won prize, the porch. Notice This was not staged, it was merely a normal part of nature. I don't want to hear any crap from liberal morons or PETA folks. Personally, I love cats. I feed these two feral cats once a day (Obviously the tough Tabby eats first..). They eat less birds that way too. I also try to see that they are healthy. We can't save everything. For the record, the Tabby lets me pet him, he's nice and friendly but too wild to be handled or be put in a carrier to get fixed. The BW won't come near me and mostly gives me suspicious looks. As to the fight, it's not my doing, I am not these guy's keeper or boss, only a benefactor, and if anyone thinks I should reach in there to stop such an altercation, well.. just read the blow by blow again, and consider what can happen to a person's arm in two seconds when you have two unhappy 12-lb nonfat feral tomcats wrapped around it. That's 32 claws and 8 fangs. This report is also a good illustration of why everyone should have their pets neutered. These two animals would not be in this rough situation: running the streets, fighting, living from trash cans, and begging for handouts if people would just get their darn pets neutered! 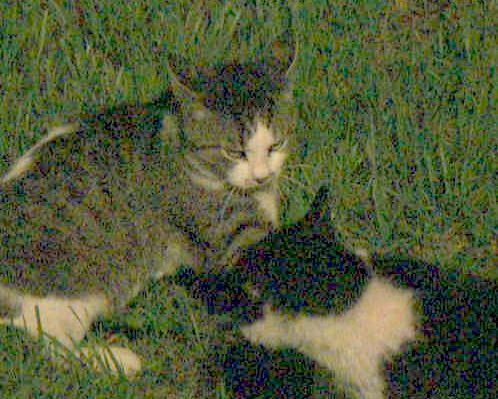 The average life expectancy of an outdoor cat like these is 3-4 hard years (a 4 year old cat is equivalent in aging to a 45 year old person, but after 5 years, they age very slowly). Indoor cats typically live happily to 15 years or more (equivalent to 80 cat-years), bringing joy to their family.